Go to the sign up page on the ironSource website. Provide your name, email address, and an account password. Click Sign Up and you will receive a confirmation email to your mailbox. To complete the sign up process, you must click on the link in the confirmation email and verify your account. You’re signed up! Welcome to the Supersonic Family. If you experience any trouble, submit a request to our developers support team. 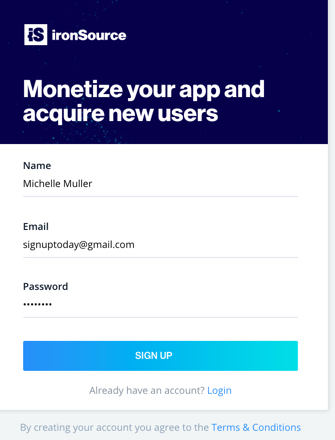 Add your app to your Supersonic account to start utilizing our mobile monetization and promotion tools! If your app isn’t live yet, you can use a temporary name and provide the app URL once the app is live.